Persistent pain in the area around a single tooth may indicate that it is extremely infected or decayed. The good news is Palmdale dentists Drs. Oh and Couto at AV Sierra Dental Center can often relieve discomfort quickly with a root canal treatment, saving a tooth that is severely damaged. 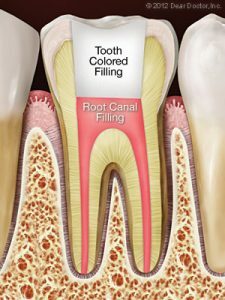 Though the term “root canal” has a notorious association with pain, with all of the advances in the field of dental care and pain management, receiving a root canal treatment is now a comfortable and efficient way to preserve and restore your oral health. 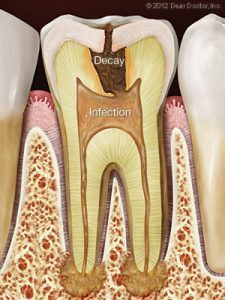 During a root canal, Dr. Oh or Dr. Couto gently remove your tooth’s damaged tissue and nerves, then carefully cleans and seals the tooth to protect it from bacteria. The procedure may require more than one visit, depending on the severity of the infection and the type of restoration — typically a filling or a crown — that is needed. In most cases, receiving a root canal treatment feels like receiving a filling — and at AV Sierra Dental Center, we offer comfort options that eliminate pain and induce a serene, relaxed state while we perform this simple procedure. If you are experiencing tooth pain, call 661.202.3542 today to schedule an appointment with our Palmdale dental office.